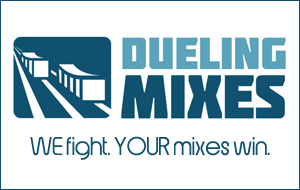 I want you to join Dueling Mixes. Why? Because I think you’ll LOVE IT. So…if you like to mix, and you want to get better, Dueling Mixes might be exactly what you need. Joe + Graham = Better – Dueling Mixes is not just me. It’s me and my dear friend Graham Cochrane. Two mixes. Two tutorial videos. Two very different mixing approaches to same song, each month. Automatic Portfolio Builder – If you commit to mixing one song every month, in one year you’ll have a full album’s worth of songs in your portfolio, songs you can use to promote your skillz to potential clients (and make some $$). Share Your Mixes – You may not know this, but there’s a special members-only forum, where members are actively sharing their mixes of this month’s song. Get feedback, hear what other folks are doing, and have fun while you’re at it. If you want to get better, Dueling Mixes will help you. And once you’re better, you really only need to land one paid mixing gig to cover your membership dues for MONTHS. So, whadya say? Come join us?